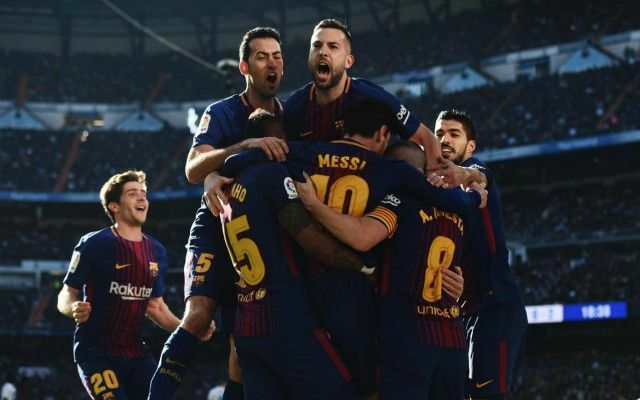 Barcelona won El Clasico 3-0 against Real Madrid to all but end Zinedine Zidane’s side’s hopes of retaining their La Liga crown this season. Goals from Luis Suarez, Lionel Messi and Alexis Vidal delivered the three points for Barca at the Bernabeu, putting them 14 points clear of Real at the top of the table. Cristiano Ronaldo might’ve just beaten Messi to the Ballon d’Or, but it was the Argentine who had the last laugh today…and to think there was talk of Barcelona giving Real a guard of honour for winning the Club World Cup! Who else but Lionel Messi? With a goal and an assist, the Argentine superstar decided El Clasico once again and made all kinds of history in the process. He certainly loves this fixture and he’s lit it up again with his performance today, surely all but ending the title race as a contest this season. Much will always be made of Cristiano Ronaldo when Messi plays like this, but in truth it was another big name that let Real down today. Sergio Ramos is usually Mr Reliable in the big games, but he could do nothing about the quality of Barcelona’s attacks today. He wasn’t helped by Dani Carvajal’s sending off, but you’d hope for more leadership from an influential player like Ramos. Messi is now the all-time leading scorer with one club in Europe’s top five leagues, netting 526 times for Barcelona. The 30-year-old is also the leading El Clasico scorer at the Bernabeu with 15 goals. No player has scored more La Liga goals against Real Madrid than Messi. Ever.